Gustav's name sounded like the national anthem in the years of the Czech people, so legendary and venerated this name became. During difficult times of the Czech nation, when Czechs were under the rule of the Austro-Hungarian Hapsburg Empire or later, during the Nazi occupation, the Fristensky name was synonymous with all national pride and patriotism. He was so famous that a host of imitators arose to wrestle under his name though no one really challenged his supremacy as he often found them and did his job for them on the mat. Some foreign accounts gave him well-deserved nickname"Bohemian Hercules," but journalists and promoters in the Czech lands named him rather buoyantly the "Heroic Bivoj" or "Iron Gustav." (Bivoj was a person from the old Bohemian mythology who is said to carry a wild boar on his shoulders). But for the masses he was simply "Fristak" - (Frishtaak). Gustav Fristensky wrestled his first match at age 19 and his last at 72. He won both, and in between them won nearly 10,000 more. His losses could be counted on one hand. Mr. Stuchlik's (Gustav's former school teacher) advice to get off of the train in Brno that was supposed to take him to Vienna, Austria for his new work as a butcher there was life changing. Mr. Stuchlik's brother-in-law referred Gustav to the Safar butchery in Brno in central Moravia then mostly populated by German inhabitants. He was staying at his Uncle Alois Chodera's apartment in Brno. It was a major change for the young Gustav to be away so suddenly from the reposeful surroundings of his parent's home and he didn't feel very comfortable there and was very homesick. Fortunately, Gustav's uncle brought him to the local SOKOL (see more on Sokol under….) gym. The Sokol's atmosphere that encouraged physical fitness and stressed Czech language and Slavic culture appealed to the aspiring athlete. He immediately began to exercise very vigorously. Gustav has never seen a professional barbell set before, but he was soon working out with the heaviest barbell (125 lbs.) the gym had available. After few weeks of training he could lift it over head with one hand. Due to the additional "strength training" he got from working at Safar's butchery he soon was able to outscore his opponents in wresting matches and weight lifting and the Sokol's athletes for his enormous strength refused to train with Gustav. They recommended him to continue his athletic development in the Czech Club Hellas, also in Brno. "When the club's brothers (Sokol Tyrs) realized my strength they pulled out never used 125 pounds heavy barbell for me. Just in a few weeks of training I lifted this barbell 15x in succession from my shoulders up. They recommended that I join another club called Hellas that employs only strong men. They advised me that they are the strongest men from the region only, they are all very muscular, and sometimes they practice wrestling amongst each other. I replied; oh no, I am not going there, I am afraid of them……"
This club was more specialized for athletes who aspired in wrestling and weight lifting. During his first visit at the Hellas Club the head coach Richard Hromada put him through a test just to see if he can fit among the strongest man in Brno. To Hromada's astonishment Gustav was the club's strongest men in weight lifting right away. Without any hesitation and with anticipation of a great "catch" for his club he asks the muscular junior: "Do you smoke?" – "No", was the answer, "Do you drink?" – "No", "Are you dating a girl?" – "No" (he was almost 20), "Stay with it and you will be very successful." Final words of coach Hromada that Gustav remained true for the rest of his life except the dating part, but about that later. So at this stage of his life Gustav fell in love with weight lifting and with Greco-Roman wrestling. He trained enthusiastically every day, which for that period of time was unheard of. He practiced two times per week in Hellas, two times still in Sokol and the rest of the week at home with his home made rock-weights. At twenty years of age he was presumably the strongest men in the entire Austro-Hungarian Monarchy without even knowing it. In the mean time, and due to Gustav's steadily growing strength, Hellas Club was forced to purchase a new set of 325 lbs barbell. Also, at this time he became a very compassioned student of Greco-Roman wrestling. Some of the older and experienced wrestling members were watching him very closely, anticipating unwanted competition within the club. At some point they were even discouraging Gustav to continue with wrestling…apparently for a lack of talent. But he followed his course. During a city fair in the nearby town of Vyskov as a highlight of this event there was staged a wrestling tournament. The first price was a silver horse shoe attached to an ebony cane. The best 12 wrestlers representing Hellas Club took the stage. Gustav was the youngest and least experienced junior that no one was giving a slight chance. After several hours, however, he defeated all of them and claimed his first wrestling victory in his just beginning career. By handing him his first price, the fair's director announced: "We have not counted on you young men…you took as by surprise," and he concluded: "Be it that this silver horse shoe will bring you luck in your future endeavors." This horse shoe was not as painful as the first one during his apprenticeship as blacksmith. From this moment on a horse shoe became Gustav's good luck talisman. This event took place in July 1899. Gustav was 20 years and 3 months young. Three months later he won the annual Hellas Club championship toping all of his club comrades in both weight lifting and wrestling. In October 1900 the renowned Prague's Athletic Club (A.C.) Sparta was organizing an international sporting event that included wrestling, weight lifting and track and field competitions. The best athletes in all disciplines some of whom well known in Europe were representing Austria (Moravia as part of Austria) and Hungary. Hellas Club sent the young and un-known Gustav. The organizers were disappointed with Hellas because of not sending anyone to compete in the "strong men" competition. Due to his not heavy looking physique they taught that Gustav was signed up for running events only. What a mistake. He easily won both "strong men" disciplines, weight lifting and wrestling. On his way out he was held by the organizers if he would safe the Czech name in discus throwing. The Hungarian discuss throwing champion was leading and there was no one to challenge him. Gustav hesitated because he was not trained in this discipline. But he went anyway …and won! The following years Gustav was very busy by competing in weight lifting and wrestling claiming victories where ever he went. Nevertheless, Greco-Roman wrestling was his passion and he was eager to engage with the best in Europe. He became Champion of Moravia and achieved victories in many tournaments in Prague. However, his busy schedule at the butchery where he, because of his strength, was assigned to perform more and more work didn't allow him for adequate time to train enough. He resigned his position and begun to work at the butchery Schoeffer. It was about the same amount of work, but it was much closer from his work place to the Hellas gym. During a regular train stop in the station of Kolin (nearby Gustav's home village of Kamhajek) on one of many Gustav's voyages from Brno to Prague to participate in another wrestling tournament, there was his mother waiting for him at the platform. Even the short minute of encounter was for Gustav's mother enough to put a coin into his hand: "For you to be stronger" she whispered in his ear and kissed him goodbye. At that time this Austrian 5 Crown coin represented Gustav's one week income. Later Gustav had attached a locket on this coin with these words: "From my mother to be stronger", and kept it with his other trophies. In February 1902 Gustav won the official Czech Championship in Prague that was running analog to the international tournament of professional wrestlers. Among the professional wrestles was also George Lurich, a world champion from Estonia. They became much closed friends, and Gustav's idol and teacher, for over 20 years until Lurich in 1920 (aged 43) prematurely passed away. In the middle of the year Gustav became a Champion of the Austro-Hungarian Monarchy by winning a tournament in Brno. Like that wouldn't be enough for the still very young and fairly inexperienced Gustav he became a Champion of Central Europe be beating the internationally known German wrestler Sochor in an astonishing time of 3 minutes. You already know from previous section "Gustav's Ealy Life" when Gustav as an apprentice while in Kourim witnessed the strong man James Deleware performing his strong tricks and a wrestling bout. Now about 4 years later Gustav already well known wrestling athlete was challenged by James Deleware for an official wrestling match in Brno. At this time many wrestling competitions were staged in circus tents due to a lack of large enough gymnasiums or halls that would accommodate adequate number of spectators. Gustav remembered very well Deleware's style of wrestling and was determined to demonstrate who the "boss" in Brno is. It took Gustav just about 7 minutes to squeezing his much heavier opponent from behind, lifting him up, turning him around with his feet in the air smashing down on his wide shoulders. And the match was over. Shocked Deleware demanded a new bout, which was granted in three weeks in Olomouc. The outcome was the same with one difference…..the match lasted not even 3 minutes. Since the beginning (July 1899) of his still short wrestling career he has no lost a single match. He really wanted to know how good he is. In the beginning of 1903 he was informed by his Hellas's coach Hromada that there in Rotterdam, Holland from February 8th will be staged the official European amateur wrestling championship. The best amateur wrestlers from all over Europe will participate. Gustav could not sleep over this news; this was his chance to measure his talent against the best. Does he have at least a slight chance to compete against many wrestlers with much more experience? Will he be embarrassed? He decided to go. Never before was he out of Bohemia. How does he get there? And how much it all will cost? "At the Hellas Club they did not believe I could do anything among the best wrestlers from all over Europe," Gustav recalled with a smile, "so I took out my savings and went." He took 5 days vacation from his work and took long overnight train raid to Rotterdam. Upon arrival there he was tired from the long train journey and very hungry. He found a small hotel. As soon as the hotel manager found out that Gustav is not here as a spectator, but as a participant, he vehemently was trying to discourage Gustav of doing so. "There are three former European champions and many other wrestlers of very heavy weights here.…you do not have a small chance," was he trying to convince Gustav. But Gustav had his sight set differently. Arriving at the coliseum, the organizer could not find his name at first, but there he was on the bottom of the long list of participant. He was assigned a small room under the steps as his "locker room". He just managed to eat a left over from his sandwich, change in his wrestling outfit and already there is the orchestra playing the march of gladiators to be introduced on the stage. There were over 100 participants from all over Europe. He was the only Czech from Bohemia there. There is no weight class differentiation. You win by pinning your opponent on both shoulder blades. No time limitation. The matches were fought tooth and nail. The roundabout of matches started at 2PM and would end the next morning at 5AM. Out of the competitors in attendance, Gustav was weighed the least - 200 lbs. Despite all drawbacks he was pinning one opponent after another without a major rest period, and early morning next day he emerged among the top three. His final opponent, last year's European champion and the best old continent's undefeated warrior Heinrich Eggeberg (250 lbs) from Denmark, Gustav lifted him up over his head, spun him around, and then threw him on to the ground like a ragged doll…in 26 minutes. At 5:30 AM early that morning and by the ships' steam whistle sounds leaving the haven, Bohemia had his first European Champion. Back in Brno he was praised for is victory in the championship, but he was fired from his job at the butchery. The traditional German company Schoeffer would no longer employ a "Czech bully." From there on the freshly baked amateur European champion would not find employment as a butcher. For a half a year he supported himself as a model for picture postcards, posing in the image of ancient mythic gods. His reputation was steadily growing around the amateur rings around Europe. In addition to this, he was noticed among many professional wrestling groups and promoters around Europe. He was invited to several professional tournaments, but he wasn't sure if he is good enough to succeed among the "big boys." In order to find out if he can be one of the "big boys" he applied a trick. In his own words: "The more I was thinking about this situation the more I realized that by remaining amateur I am not going to be able to completely engage in my beloved sport of wrestling with the vigor as I desire. Additionally, the amateur status also limits my development in this sport to be the best I can. But at this time I didn't have enough courage to make the radical move to the professional wrestling. Therefore, I decided to make a compromise to be a "professional apprentice" under pseudo name." In March 1903 Gustav travels to Colon, Germany to participate in a professional wrestling tournament under the name of Stanislav Bolowski. In the first few days of the competition he easily pinned five German opponents. The next was a former professional European champion Van den Berg. They wrestled for 30 minutes without a decision. And that was a sensation. "From this moment I cleared my pseudo and begun my professional career under my real name," Gustav acknowledged later in his memoires. This successful tournament helped him to decide to make the difficult step to make the move in the elite of professional wrestling. 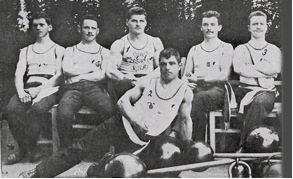 The remaining months of 1903 spends in the Czech lands participating in many tournaments just to name a few: Winning an international tournament in wrestling and weight lifting in Brno. In Prague he enters, without practice, a discuss throwing championship of A.C. Sparta Prague and winning it with 120 feet throw. At the same event, he wrestlers in the final bout his Czech rival from Prague Josef Smejkal. After few minutes Smejkal surrenders apparently due to exhaustion from previous matches. Again in Brno Gustav defeats Bavarian world class champion Michael Hitzler in 56 minutes. nearly 2000 bouts as an amateur and has lost none! As a celebration for his departure from the amateur athletic competition, his home Club Hellas invited the best Czech and Moravian wrestlers to Brno. He took on another magnificent level of wresting by competing against all of them. At 4 a clock in the afternoon began the gigantic competition of one against nineteen. The arena was full of spectators that came to see their Fristak last time as an amateur. He pinned them all down one after another in three hours. If we discount the tree minutes break between each bout the entire Gustav's performance lasted two hours. This may possibly be a record that still may stand. The prize money earned from these matches he donated to the development and expansion of Czech schools in Brno. During his amateur career he participated in nearly 2000 bouts loosing none! He was 24 at this time and the wrestling world was waiting for him to be conquered. In the winter of 1904 he has had accepted an invitation from George Lurich (his Estonian wrestler-friend) and travels to St. Petersburg (Russia) and Helsinki (Finland), where his glorious 32 years long professional wrestling career begun.